Modular Home Companies purchase lumber and brand name materials in huge quantities directly from the manufacturer resulting in lower costs. A clean plant, indoors, avoiding inclement weather, results in greater labor efficiencies, lowering cost. Recycling plus warehousing materials in a secure environment, with protection from weather and job site theft, lowers cost. Precision equipment and efficient material handling result in more accurate construction with fewer mistakes and lower cost. Modular Homes are built to the appropriate building code required by each state, inspected by both the manufacturer and Independent Third Party Inspection Agencies. This results in fewer construction errors and lower costs. Since Modular Homes are delivered to the job site about 90% complete, total construction time is greatly reduced, incurring less interest and quicker occupancy. Modular builders provide the necessary stamped house plans for building permits without requiring an architect, lowering costs. Our method of construction requires fewer bank inspections, resulting in lower bank fees. Additionally, reduced construction time results in lower construction loan interest charges. Each Modular Home undergoes rigid quality control inspections by a Quality Assurance Department trained to inspect every aspect of construction from framing to final finishing details including electrical, mechanical and plumbing. All homes are inspected to ensure that they conform to each state’s building code by an INDEPENDENT THIRD PARTY INSPECTION AGENCY. The entire quality control process starts with the inspection of raw materials as they are received by the plant to ensure conformance to high quality standards and specific state code requirements. Modular Homes are constructed in spacious, indoor climate controlled production facilities. Skilled craftsmen build your home uninterrupted by inclement weather. 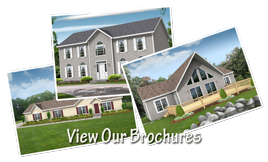 Modular Homes come in many different styles, including ranch, cape cod, split level, and two-story. Although there are many standard floor plans to choose from within each style, complete design flexibility and customization, including the ability to draw your own unique design is available.